A very young (and small) Thorold Merrett photographed at Victoria Park (Collingwood), circa 1950. Merrett, later famous for his magnificent stab-kicking, came to Collingwood from Cobden. 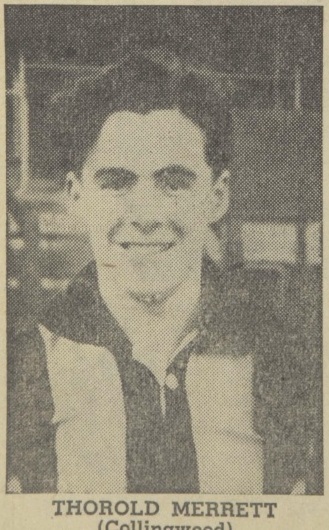 Starting as a diminutive sixteen-year-old, Merrett played 180 games for the Magpies from 1950-60 before a broken leg prematurely ended his career. The brilliant wingman won two best and fairest awards (1958,1959), played in two premierships (1953, 1958), and represented Victoria seven times. This same photograph of Merrett is reproduced in The Official Collingwood Illustrated Encyclopaedia, p. 70. The location is absolutely identical. Maybe the Record Photo is taken from a second image or maybe slightly doctored.